Fishtoft's Reece Sullivan challenges Brandon Rylett of Coningsby Reserves. 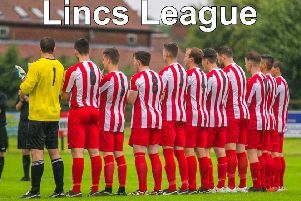 Skegness Town Reserves’ unbeaten run came to an end in an eventful game at Old Leake in the Taylors Garages Premier Division. Town were missing the services of striker Josh Whittam but Old Leake were also having to make last-minute changes to their goalkeeping position after Shaun Robinson was involved in a car accident and recent signing Mitch Griffiths was unavailable, meaning that there was a first outing for 16-year old Owen Richardson. Skegness opened the scoring with a cracker of a goal and they could have gone further ahead but they saw a goal-bound effort cleared off the line. Old Leake had a golden chance to level the scores in the second half when they awarded a penalty but Scott Mackay’s spot-kick was saved by the visiting keeper. However, the game’s main talking point happened shortly afterwards when Adam Abell broke clear and fired the ball home low into the bottom corner but, as he turned to celebrate, the referee waved play on after he failed to notice that the ball had struck the back stanchion before rebounding straight back out into play. Leake didn’t have to wait long for their equaliser, Mackay created some space before lobbing the ball over the advancing keeper. Skegness regained the lead before Old Leake substitute Lewis Baines turned the game in his side’s favour late on when he made it 2-2 and then fired in a cross from the bye-line which a Skegness defender could only deflect into his own net for the winner. Final score 3-2. Three goals in the final 15 minutes helped send Swineshead to a 4-0 home Premier Division success over Benington. A Bert Snaith strike on the stroke of half-time was all that separated the two sides after an even opening period. A stunning strike from Jack Houghton then doubled Swineshead’s lead and, as the match entered the latter stages, the hosts added two more goals to seal a deserved success. A Shaun Boothby hat-trick helped Coningsby to a 4-1 home win against Pointon. Tom Sewell hit the other Coningsby goal. Leverton powered into an early 2-0 lead in their home match against Ruskington Rovers with tidy strikes from Jay Lawrence and Dom Goddard before the visitors pulled one back. The half-time break proved the turning point for Leverton as they powered into a 6-1 lead when veteran Lawrence completed a perfect hat-trick. A thunderous 25 yard strike from Nathan Hubbert and a penalty from Toni Pascu completed the scoring. Ruskington reduced the arrears with a tremendous second to make the final score 6-2. Rovers’ goals came from Luke Llewelyn and Sam Jackson. Two goals from Shane Brackenbury helped Wyberton Reserves to a 3-0 home win against Billinghay Athletic. Tyrone Chase grabbed the other Wyberton goal. In the basement battle between Heckington Millers and Boston College the match was settled by a single strike. Fortunately for The College it was they who grabbed the crucial winner in a 1-0 away win. Railway made the long trip to Tetford, coming away 3-2 winners in the Taylors Peugeot Division One thanks to a last-minute debut winner form Lee Dakin. Tetford had opened the scoring when they capitalised on a wayward back pass which didn’t reach the keeper and that’s the way it stayed until the interval despite Railway creating a few good chances. The equaliser finally came when 16-year-old debutant Baily Lucas swung over a pin-point cross for Curtis Yeatman to nod over the Tetford keeper. The visitors then took a 2-1 lead after a cross, this time from Yeatman, was met by the head of Jake Portas at the back post to nod home. Railway seemed to be seeing the game out at 2-1 when a heavily-disputed free kick was awarded to Tetford on the edge of the Railway box and the free kick was struck superbly into the top corner to make it 2-2. The winner came in the dying minutes when a superb cross from the right by Jak Stephenson found debutant Lee Dakin at the back post to head across into the far post and seal the three points for the visitors. Nathan Wright and Tom Flatters were on target for Tetford. Fulbeck United remain in contention at the top following a 2-0 home win against Freiston. Cameron Clay and Will Allen struck the crucial goals for United. It was frustration for Fosdyke again as they lost 2-1 at home to promotion hopefuls Fishtoft. Fishtoft did manage to breach Fosdyke’s rearguard twice in the first half - a headed chance which went wide and Ian Jack Smith pulling off a spectacular save to palm away a long range effort. At the other end Fosdyke’s chances were few and far between, although they crept in to the game as the half wore on and the first period finished goal-less. The second half was, yet again, another hard luck story as a bizarre own goal by Michael Beauchamp gifted the visitors a lead and the inevitable collapse looked a possibility. However, Fosdyke stood firm and got back in to the game following a double substitution which helped produce an equaliser. Zeph Chapman raced down the wing to swing a cross in to the box which was met on the full by Danny Beecham, whose rasping drive was goal bound until a Fishtoft defender blocked it with his arm. Up stepped Leon Marsh to fire home the equaliser from the spot. There was really very little to separate the sides from then on but it was Fishtoft who had the final say when Beauchamp was harshly judged to have handled in the area and the resulting penalty was dispatched by Matty Hood to give the visitors the lead again. A fightback ensued and Ben Lawton had a shot deflected wide while Smith was on hand with a couple of fine saves at the other end. Friskney striker Greg Brown hit a hat-trick in his side’s 5-1 away win at FC Kirton with Bob Jackson and Chris Harker also getting on the score-sheet. Perry Spratt replied for the home side. Callum Cheetham hit the Woodhall Spa United goal in their 1-1 draw at home against Swineshead Reserves. Sibsey still head the Taylors Ford Division Two table following a 5-1 home win against FC Wrangle, with Ryan Austin hitting a hat-trick for his side. Kayne Tate and Macaulay Blackamore were also on target for the leaders. Wrangle’s goal came from Chris Jackson. The Tattershall Road derby between Park United and Boston International FC was a very tight affair with both defences on top. The first half finished goalless as the teams cancelled each other out before Park finally broke the deadlock in the 70th minute when Jimmy Harris coolly slotted the ball past the keeper. Boston International never gave up and they pushed Park further and further back as the half wore on, and they finally got their reward in the last minute when a cross deflected off a Park defender beyond the despairing dive of Luke Gilding in goal to make the final score 1-1. Unfortunately East Coast FC withdrew from their scheduled fixture for the second time this season because of a shortage of players, giving Billinghay Reserves a much-needed three-point haul. Fishtoft Reserves and Coningsby Reserves drew 1-1 while Kirton Town Reserves won 6-3 at Swineshead A.
Northgate Olympic were the day’s biggest scorers in the Taylors Vauxhall Division Three, with a 6-1 home win against Fosdyke Reserves. But even the home camp admitted that the visitors played much better than the scoreline suggested. In an evenly-contested first half the scores stood at 1-1 at the break before a couple of early second half goals meant that the visitors had to chase the game and, in doing so, were hit again on the break as the home side took full advantage of the slick 3G surface. Daniel Broughton hit a hat-trick while Rob Spencer, Kyle Steele and Lukasz Orminski were also on target for Northgate. Lloyd McCann replied for Fosdyke. Wyberton A lead the way at the top of the table following a 3-1 away win at Old Doningtonians Reserves. Michael Reeson, Ellis Wakefield and Jason Allen hit the vital goals for the visitors while Ollie Gedney replied for The Dons. Spalding Harriers and Benington Reserves played out a goalless draw although it wasn’t as dour as the scoreline suggests with both sides contributing to a hard-fought encounter. Mareham United got back to winning ways with a 5-2 home win against Boston Titans. Chris Barnes (two), Sam Perry, David Maplethorpe and Jack Harwood hit the match-winning goals. he Dons fell to a 4-2 defeat with Luke Barnett and Liam Barnett grabbing their goals while The Bank were comprehensively beaten 6-0.